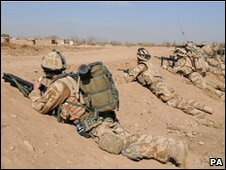 UK and other Nato troops are to launch the biggest operation yet in Helmand province in southern Afghanistan, the BBC has learned. The British general in charge of forces there said it would "assert the control" of the Afghan government in parts of Helmand now under the Taliban. Maj Gen Nick Carter said Helmand was "a work in progress, with parts simply ungoverned". British troops have been in Afghanistan since 2001, and 251 have died. The news comes four days before an international conference in London which will announce new plans for the future of the country. Gen Carter told Radio 4's World at One that if parts of Helmand province were governed at all, "it's by parallel governments provided often by the Taliban". He said: "If we're going to win the argument on behalf of the Afghan government... then we need to assert the government's control over those areas which are at the moment ungoverned." Gen Carter, who took over the control of Nato forces in southern Afghanistan in late 2009 and leads 45,000 servicemen and women, refused to say when the joint Nato/Afghan army operation would begin. At Kandahar airbase in the south of the country, Nato commanders are currently masterminding the plans, made possible by the huge increase in US forces agreed recently by President Obama. But given the deaths suffered during the last major offensive in Helmand, Panther's Claw, there will be trepidation about the possibility of more casualties. Senior military figures acknowledge there will be some, and the BBC has been told that there are many improvised explosive devices (roadside bombs) in the area. Maj Gen Nick Carter went to Kabul last Thursday to brief President Karzai about the operation. Senior Afghans have promised full support and have welcomed the fact there will be a full gathering of tribal elders before the operation takes place. But there's a strong sense among senior Nato figures that military success will go nowhere without political progress, which is why hopes are being pinned on this week's Afghan conference in London, being chaired by President Karzai. But he said the area to be targeted was predominantly central Helmand, to the west and south-west of Lashkar Gah - parts of which have not been under Afghan government control for months or years. It was a "significant population centre" of about 250,000 people, he said. He would not be drawn on how many casualties he expected. But if there was a conversation before the operation between the Afghans and village leaders, he said, "we often find the Afghans don't fight - but they will welcome you". He pointed to an operation run in a similar way by Canadian forces to the west of Kandahar "where not a shot was fired". And in an operation by the Grenadier Guards in central Helmand province "the same effect was created", he said. An earlier offensive, Operation Panther's Claw, was launched in Afghanistan in June and July last year. Ten soldiers died during that operation, which focused on an area the size of the Isle of Wight between Helmand's provincial capital, Lashkar Gah, and its economic capital, Gereshk. But Gen Carter said since then, there had been signs Afghans in the area were taking a greater role in operations - which meant less fighting. "What I've been very struck about... is the way the provincial governor, Governor Mangal, and the Afghan army and Afghan police wish to take ownership of this problem. "And when they do, there is an Afghan answer to the problem," he said. "Afghans are standing up and being counted... and that makes a big difference to what happens on the ground." The news comes as Nato's top commander in Afghanistan, US Gen Stanley McChrystal, said increased troop levels could bring a negotiated peace with the Taliban. He said a political solution in all conflicts was "inevitable". The head of the British Army, General Sir David Richards, said while negotiations were "something we must entertain", it had to be done from a position of relative strength. The terms of any deal should include a requirement that the group cut ties to al-Qaeda, he told Reuters journalists.